Heat a flour tortilla for 15-20 seconds on high in the microwave oven. Spread out the tortilla on a work surface. Coat the tortilla evenly with salad dressing and cover with slices of turkey. Pile some rice on one side of the turkey. Arrange the bean sprouts, pepper strips and cheese strips in a line on top of the rice. Season with salt and pepper, to taste. Wrap and roll the sandwich up around the rice, veggies and turkey, making the ingredients resemble a sushi roll with the cheese and veggies at the center of the rice. Cut the sandwich wrap into two-inch-long pieces. Arrange the pieces in a plastic container or on foil and pack up for lunch! In Recipes-list.com we have selected the most viewed recipes from category - uncategorized . Enjoy the best recipes specially selected for you! 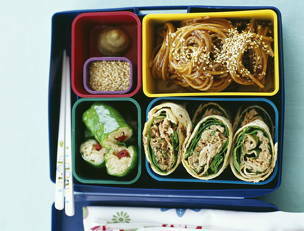 Lunch Box Turkey “Sushi” is the right choice that will satisfy all your claims.